The more things change, the more they stay the same…except in email where change is constant and fast. Although not everyone nor every industry keeps up: I still see old-school subject lines and emails in my inbox every day, so maybe some things do stay the same. That does not mean they should, however. And if your approach to B2B email marketing hasn’t had a refresh in a while, that might be a good place to start thinking about some changes. One of the most significant changes has little to do with the content of your emails and everything to do with your ability to track and score leads, and that’s the growing popularity of marketing automation technology for B2B marketing. With CRM systems and marketing automation solutions, prospects can be followed through the sales pipeline and marketed to appropriately at every stage. Which—although it’s not necessarily email marketing—requires changes to approaches in email marketing, because that is a key component to making marketing automation work. Can I have a dollar for each donotreply@ email that shows up? Please? I’ve got college educations to fund in the future, you know. That’s the extreme example, I admit, but I still see plenty of cold, stiff B2B emails that lack any kind of personality—or indication that a real person was involved in their creation. How about a real person’s name in the From line? For extra credit, how about a real person’s name in the signature too? By this, I mean design for mobile. Chances are really, really good that your email is going to be viewed on a smartphone first, if at all. Use responsive design for your B2B email marketing to ensure your email works no matter where that busy exec is in their day. Even if you don’t adapt any of the first three ideas, please keep your emails short and sweet. Email is now just one means of communicating, and chances are your audience is also getting texts, Facebook messages, tweets, chat messages and more all at the same time. Get to the point and be sure your call to action is easy to find. No matter the role email plays in your B2B marketing, make sure it’s keeping up with the changing times and fits in with the expectations of your prospects—who are, after all, human. We talk a lot about consumer emails here but today we’re looking at three very different B2B email marketing strategies, which range from basic to advanced. Needless to say, email programs in the business-to-business realm have certain attributes that make them different from the average consumer email program—like longer sales cycles, higher price points and fewer products to sell. Today, we’ll review a few B2B strategies that may help you to, not only, stay in front of business prospects/clients but help you ring the cash register harder, and more often. Let’s begin. In the example above from Wildfire, the company reached out to its subscribers and clients asking for followers on five social networks. 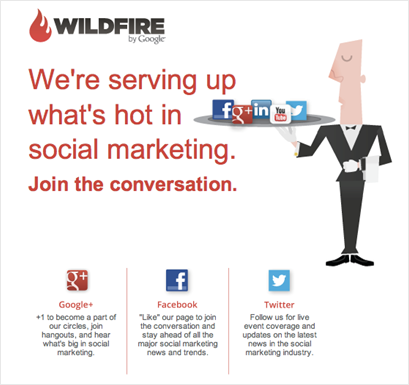 Aside from the additional reach that social media can afford B2Bs, Wildfire is likely looking to build its social following for two reasons. First, having a large social following is corresponding more with search results. 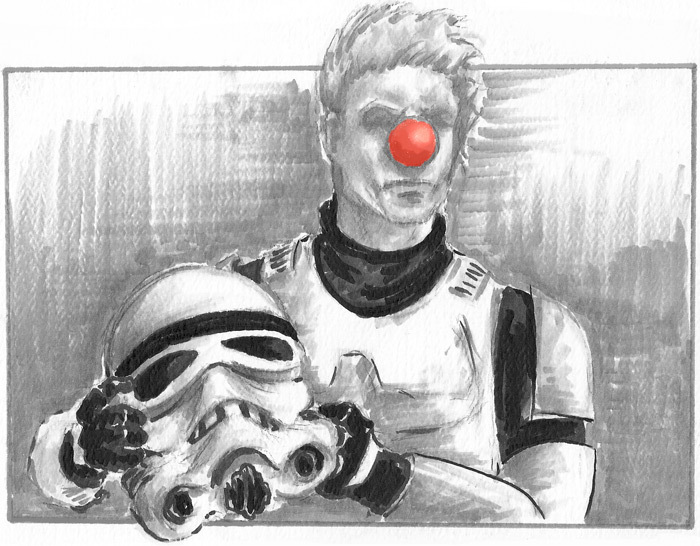 Google+, in particular, is having a bigger impact on search result. Therefore for companies looking to get more traffic from search it’s important to grow a social following. Second, a social following does have an impression on people that have just discovered a brand. When someone hears about the brand and is potentially interested in the service they’ll do some research and today one of the basic research steps is finding out how many followers the brand has on social media. It’s a quick and general way to see if others trust the brand; social proof. That said, I’m surprised that Wildfire did not include a link to their LinkedIn company profile of company-sponsored LinkedIn group. 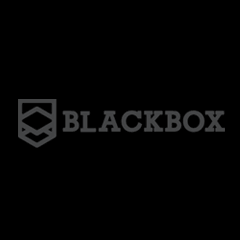 Email newsletters are common among B2Bs. They’re a great way to provide useful resources in addition to the services you already provide. You can gather articles that will be interesting and useful to your clients. But everyone does that. 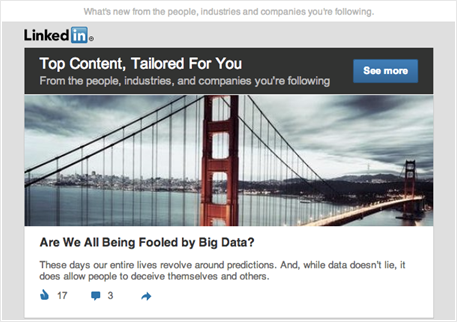 What’s unique about this example from LinkedIn is how they promote the custom aspect of the newsletter. They are using dynamic content, via merge tags, to accomplish this which insanely common in the consumer and publishing worlds but surprisingly not so common in B2B. If an email is “dynamic” it means that each subscriber could, theoretically, receive a unique email based on their profile or behavioral data. This dynamic data, which populates the content of an email, could be as straightforward as a photo and contact information of the user’s account manager or, like in the email above, it is based on a user’s LinkedIn profile. Dynamic content has proven to increase relevancy which can often accelerate the sales cycle and increase upsells. It’s no brainer. For those who are late to the party, Google remarketing provides marketers with an opportunity to stay in front of prospects who were on their site and then offer those prospects relevant display ads as they browse the web. Though it is well-documented how retailers benefit from ad remarketing, it is not always apparent how the technology can work for B2B; it’s especially unclear how it can work with your email program. I would argue that any B2B company that uses a free trial, has a freemium product, engages in active lead generation, or runs lead nurturing campaigns (which I suppose is almost every B2B) can use remarketing in their email campaigns to increase conversions and drive revenue; but they have to be smart about it. For the most part, users who have accepted your free trial, for example, don’t want to see ads for a product they’re already tested. One of the biggest mistakes in retargeting is ads asking users to take an action they’ve already taken. However, that doesn’t mean you can’t advertise to existing clients, you simply must do so in a way that adds value. One prime example is freemium products. Preaching the virtues of your paid product to your free users (via email and Google remarketing) can help increase upsells. Likewise, if you’re devoting dollars to bring traffic to a lead gen form, remarketing to those who open but (do not click) on those emails (or bounce from those landing pages) will help you stay in touch with your warm prospects, with a message that is more relevant to where they are in sales cycle. Here’s how it works. Just like you would do on your website, all you need to do is add a sales-stage-specific remarketing code into the HTML of your emails, and everyone who opens an email, in that list segment, will begin to see those (more targeted) ads all over the web. The benefit here is that you can better focus your Google remarketing efforts based on how far your users are in the funnel. That way, you can ensure you’re getting the biggest bang for your remarketing buck. What are your favorite B2B email marketing strategies? The holiday season is just ramping up, but most business-to-business marketers are already looking toward the beginning of next year. Rightfully so; now is the time to get plans ready for Q1 because that time is just as critical for B2B as the holidays are for retailers. Many businesses start their fiscal years in January. For B2B companies this means that new budgets have been approved and potential clients are out there actively looking for partners. If you can position (or reposition) yourself in the first quarter of the year you can earn new clients and get your company started out successfully next year. Each year executives look at every program that generates net sales and profit. One area that is looked at every year in many companies is the email program. Here are three high-level promotional ideas to turn those business email subscribers into clients, not matter if you’re using ad hoc email marketing campaigns or marketing automation. 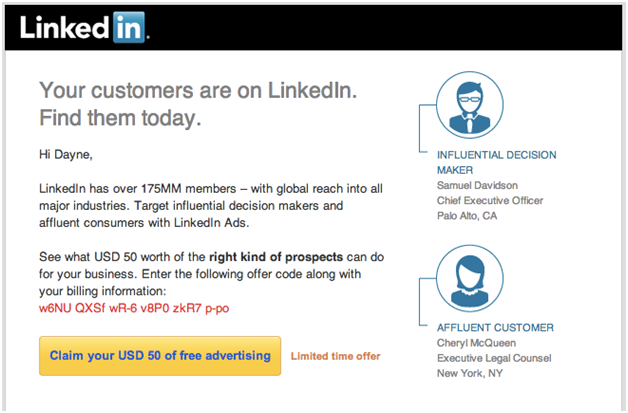 LinkedIn reaches out to its subscribers with free offers to entice action. Free trials, samples, and guarantees are a great way to get people to take the bait and grow their comfort level. People are wary about committing to something. To circumvent this hesitation you can offer them the no-risk trial, or if it’s fitting a guarantee. The great thing for you is that once they’ve made this first commitment they’ll be more likely to choose your service for the long run. Now, you do have to deliver on your promises. It’s all about getting that first commitment. You got the person to subscribe to your email program. Now use your email program to get them to take the next action step. 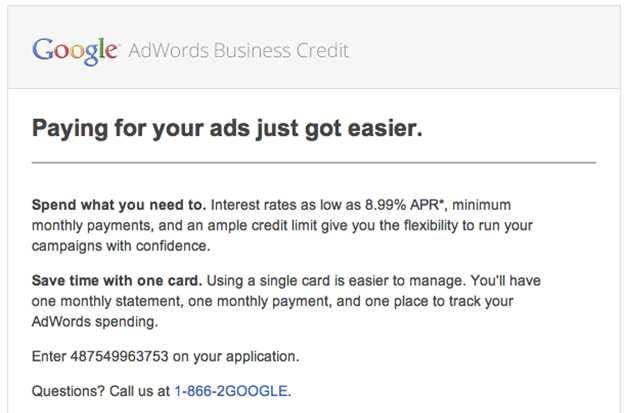 Google AdWords uses their email program to promote new products. One way to do this is by offering new products or services. The first quarter is a popular time to introduce new offerings so it’s the perfect time to increase the revenue you earn from existing clients. The product doesn’t necessarily have to be new to your company either. The product or service can simply be something else you offer that a segment of your prospect or client list doesn’t know about it or use it yet. 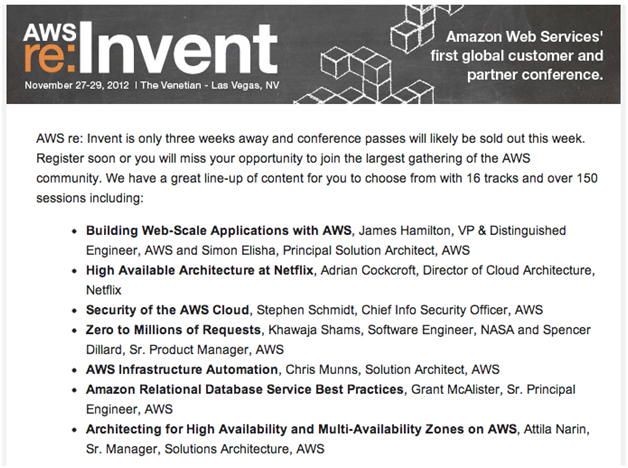 Amazon Web Services promotes an upcoming event to their email subscribers. Imagine the sales process you use when you sell something to a potential client face-to-face. The process likely takes some time and involves multiple conversations. The person will have questions. You’ll have to go back to your desk and put together some answers. This is part of the marketing process. Email marketing in the B2B world works the same way. Instead of selling to all your subscribers, it’s about marketing to them in order to move them through the sales funnel. Nurturing them. One way to do this is by promoting marketing material like events, webinars, guides and other resource material. It can all work to earn your customers trust and convince them that your solution will benefit their company. How you adapt to and harness the opportunities in the changing B2B marketing environment could make all the difference between success and failure. Join Indiemark (at booth #4) and other Focus Experts in this half-day event to make sure you’re ahead of the curve. It will cover everything from the importance of branding to implementing lead-management strategies and improving sales/marketing alignment. Pre-register here.